From My First Summer in the Sierra (1911). 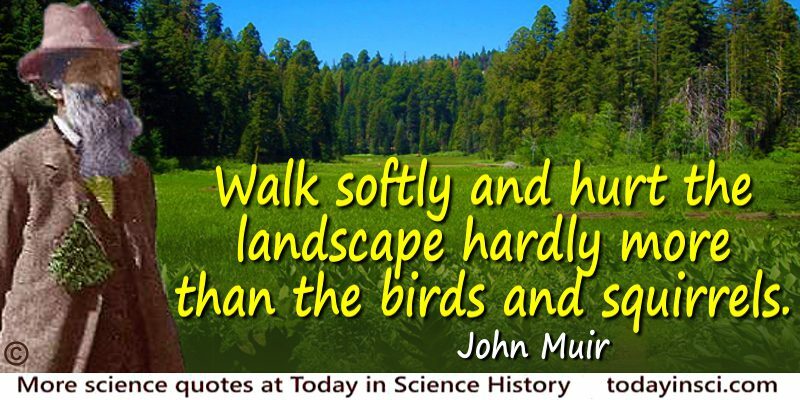 John Muir took a job accompanying a shepherd tending a San Joaquin sheep owner’s flock in 1869. For the summer months of June through September he cared for the livestock grazing in the Sierra mountains, at the headwaters of the Merced and Tuolumne Rivers. This gave him an early opportunity to learn about central Califonia’s Yosemite Valley. During this time, he wrote journals recording his observations of the flora and fauna of the area. His notes and original sketches were later collected in book form, titled, My First Summer in the Sierra and published in Jun 1911. [p.71] June 16. — One of the Indians from Brown’s Flat got right into the middle of the camp this morning, unobserved. 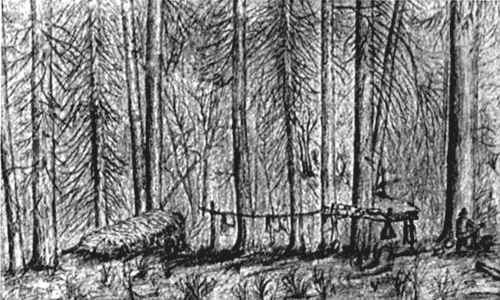 I was seated on a stone, looking over my notes and sketches, and happening to look up, was startled to see him standing grim and silent within a few steps of me, as motionless and weather-stained as an old tree-stump that had stood there for centuries. All Indians seem to have learned this wonderful way of walking unseen, — making themselves invisible like certain spiders I have been observing here, which, in case of alarm, caused, for example, by a bird alighting on the bush their [p.72] webs are spread upon, immediately bounce themselves up and down on their elastic threads so rapidly that only a blur is visible. The wild Indian power of escaping observation, even where there is little or no cover to hide in, was probably slowly acquired in hard hunting and fighting lessons while trying to approach game, take enemies by surprise, or get safely away when compelled to retreat. And this experience transmitted through many generations seems at length to have become what is vaguely called instinct. How smooth and changeless seems the surface of the mountains about us! Scarce a track is to be found beyond the range of the sheep except on small open spots on the sides of the streams, or where the forest carpets are thin or wanting. On the smoothest of these open strips and patches deer tracks may be seen, and the great suggestive footprints of bears, which, with those of the many small animals, are scarce enough to answer as a kind of light ornamental stitching or embroidery. [p.73] Along the main ridges and larger branches of the river Indian trails may be traced, but they are not nearly as distinct as one would expect to find them. How many centuries Indians have roamed these woods nobody knows, probably a great many, extending far beyond the time that Columbus touched our shores, and it seems strange that heavier marks have not been made. How different are most of those of the white man, especially on the lower gold region,— roads blasted in the solid rock, wild streams dammed and tamed and turned out of their channels and led along the sides of canons and valleys to work in mines like slaves. Crossing from ridge to ridge, high in [p.74] the air, on long straddling trestles as if flowing on stilts, or down and up across valleys and hills, imprisoned in iron pipes to strike and wash away hills and miles of the skin of the mountain’s face, riddling, stripping every gold gully and flat. These are the white man’s marks made in a few feverish years, to say nothing of mills, fields, villages, scattered hundreds of miles along the flank of the Range. Long will it be ere these marks are effaced, though Nature is doing what she can, replanting, gardening, sweeping away old dams and flumes, leveling gravel and boulder piles, patiently trying to heal every raw scar. The main gold storm is over. Calm enough are the gray old miners scratching a bare living in waste diggings here and there. Thundering underground blasting is still going on to feed the pounding quartz mills, but their influence on the landscape is light as compared with that of the pick-and-shovel storms waged a few years ago. Fortunately for Sierra scenery the [p.75] gold-bearing slates are mostly restricted to the foothills. The region about our camp is still wild, and higher lies the snow about as trackless as the sky. Only a few hills and domes of cloudland were built yesterday and none at all to-day. The light is peculiarly white and thin, though pleasantly warm. The serenity of this mountain weather in the spring, just when Nature’s pulses are beating highest, is one of its greatest charms. There is only a moderate breeze from the summits of the Range at night, and a slight breathing from the sea and the lowland hills and plains during the day, or stillness so complete no leaf stirs. The trees hereabouts have but little wind history to tell. Sheep, like people, are ungovernable when hungry. Excepting my guarded lily gardens, almost every leaf that these hoofed locusts can reach within a radius of a mile or two from camp has been devoured. 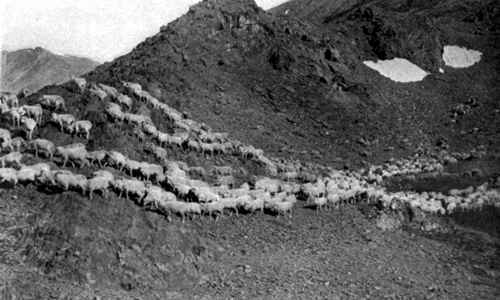 Even the bushes are stripped bare, and in spite of [p.76] dogs and shepherds the sheep scatter to all points of the compass and vanish in dust. I fear some are lost, for one of the sixteen black ones is missing.